Be a Taiwanese OEM & ODM manufacturer of precision metal parts , ALINK put much effort on innovating our technology of design and manufacturing, over ten years experience, our forming technology get a big progress from stamping skill to multi-slide forming skill, which will make a very important improvement of product reliability and material cost, especially in precision metal parts, so far, part of our product cannot made by stamping but multi-slide forming, and their lifecycle is much better, that is why our metal parts is adequate to action area. In last 3 years, ALINK focus on being a provider of EMI Shielding, SMT Finger and Board Level Shielding. We are the major application for it and still develop new product for more application. For the quality of our product, we have lots of measurement equipment for SMT Standoff and Fingerstrip evaluating to see if our product is good to our client, and we also have testers for the Metal Pressing function. Due to the metal parts will be applied in a blooming market and will get bigger in the future; we will get more testers for the more Shielding Can and Shielding Cover requirements from our client. ALINK factory contains over 40 sets forming and stamping machine, and lots of drilling and cutting machine, not only in Taiwan headquarter, our China factory also have SMT packing machine for our SMT finger and SMT Fastener product to proceed the last one process, which will let the cost of SMT packing cost efficiency and speed up volume production, we also give our China client a best and fast service with our China factory. As a leading manufacturer of precision metal parts. 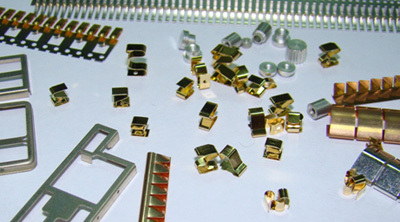 We do have a lot of experience of metal component design and solve many problem with our glory customer, innovation, efficiency, cost competitive ability is our slogan, and we will continuous to meet the demands and desire for our clients, and seeking innovative improvement to our operation so we can offer outstanding service and quality product to our customers. Best precision metal component provider, good quality controller, instant prototyping is our promise to our client, not only give a confidence but also let the business proceed smoothly. We are not only a manufacturer but also a troubleshooter if there is any kind of problem about metal parts. Most of our product is applied to computer, communication, consumer electronics field ,not only Taiwanese company but also attract well-known company in the world .most of their major product like, cellular phone, notebook, GPS, especially lots of handheld equipment will have our product in it, of course, we still continuous cooperate with our customer for the new project and create new potential market with our enthusiasm and our profession. ALINK is not only a OEM factory ,but also a ODM factory who both have design and producing ability for servicing our client, please contact us in any time and don¡¦t hesitate to contact to us if you have any question in EMI solution or product application...etc. ALINK will keep going in metal component manufacturer and provider; we will get more progress in our product and our service with our client in the future.